By the 1890s, many German immigrants in Arkansas had prospered and were understandably proud of their status as solid, successful citizens of the state. The largest wave of Germans had departed their homeland in the 1870's and early 1880's. Those who made Arkansas their final destination had found the cheap land they wanted, but also hardships as they coped with the vagaries of weather, dealt with a different language and culture, and, in some cases, faced the enmity of their neighbors. The Germans persevered, establishing successful colonies along the Arkansas River from Fort Smith to Little Rock, and in scattered outposts such as Pocahontas and Stuttgart. As Germans became fully integrated into the affairs of their adopted country, they fought a long battle to keep alive their native language and culture. One way the Germans maintained their separate identity and nourished their culture and values was through German language newspapers. In 1892, two German-language newspapers were being published in Little Rock for distribution throughout the state. One was the Arkansas Staatszeitung, the other the Arkansas Echo. These newspapers reflected some of the divisions in German society that had been brought to America. 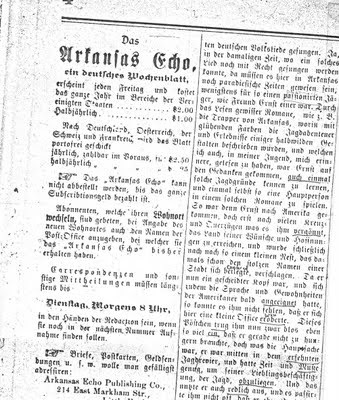 The Staatszeitung (published from 1877 to about 1918) was oriented toward German speakers who were Lutherans; the Echo (published from December 1891 until 1932) was aimed at Catholics. In parts of Germany and in Austria, the two churches had long battled each other for primacy. For example in 1870s Prussia, Otto von Bismarck initiated a Kulturkampf to reduce the rights of the Catholic Church and Catholics. In preceding centuries, the Hapsburgs had enacted anti-Protestant policies to insure the dominance of the Catholic Church in its empire. Those divisions, in much reduced form, came with some Germans who settled in Arkansas. Only a few issues of the Staatszeitung have survived, but, fortunately, a complete set of the Arkansas Echo still exists. This newspaper provides a valuable chronicle of German life in Arkansas in the 1890's and beyond. 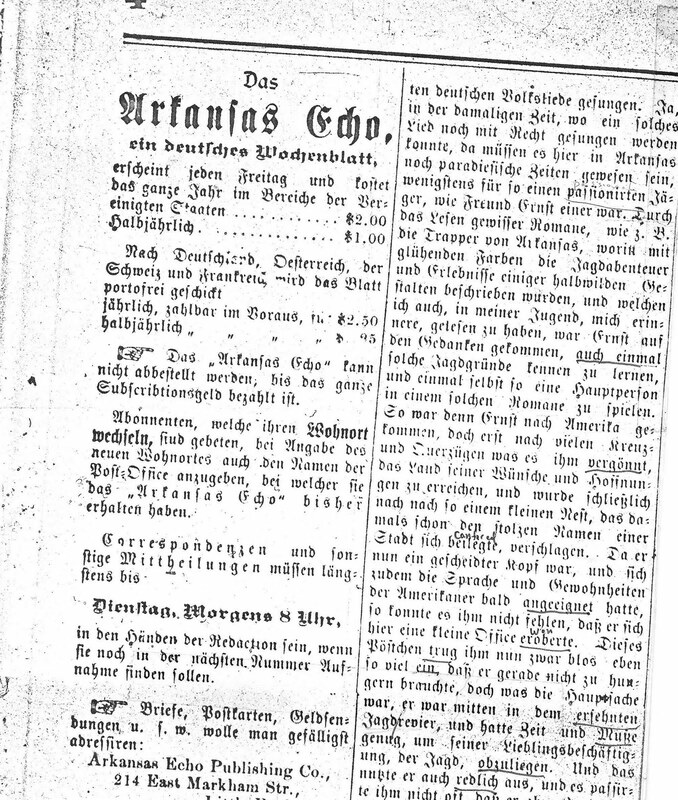 The Echo also published many articles that looked back on the history of German settlements in the state. In the April 21, 1892 edition of the paper, the editor asked readers to send in their own stories about settling in Arkansas to tell "how things often were so difficult for the first settlers and what effort it has cost to make progress..."
It took some time before the stories were printed, but at the end of 1893, a series of tales about German immigrant experience in Arkansas began to appear in the paper. They were called "Pionier Geschichten," which can be translated as "Pioneer History" or "Pioneer Tales." The latter is a more accurate description of the stories that were told. In all, sixteen installments in this series were published. These stories -- part history, mostly folklore -- introduce us to some hardy pioneers who settled the state. In the comfort of their hard-won prosperity, the Germans writing these tales could chuckle at their naiveté in those early days, brag about the hardships they had survived, and evoke the characters they had encountered as they settled into the state. Their stories contribute to the mosaic of the state's history. I first encountered the Pioneer Tales nearly forty years ago. At the time, I had my first job, in Arkansas state government, and I spent some of my spare time doing research in the archives of the Arkansas History Commission. Because I was doing research on German immigration into Arkansas, the staff there -- Russell Baker in particularly -- generously provided me with photocopies of all sixteen of the Pioneer Tales, plus several other Echo articles on the history of Germans in different parts of the state. I translated the Pioneer Tales in the years that followed, but never published them. As far as I know, the translated stories making up the Pioneer Tales have not been previously published. I will be posting several of the Pioneer Tales in this blog during the next two or three weeks, and afterwards I will post them together as a document available through the Scribd website. That entry also has a listing of interesting books and articles on this topic.